When it comes to carpet cleaning, many of us trust it to the professionals. Carpet cleaning is time-intensive and requires specialized equipment. There are a lot of things to consider: you must protect your furniture, make sure that you’re using the correct chemicals, and plan ahead so that you can allow time for the carpet to dry after cleaning if necessary. With a little bit of planning and practice, you can clean and maintain your own carpets without the expensive carpet cleaning company fees. Cleaning your own carpet may be an even better option than professional cleaning for your business, theater, organization, or home. Read the information below to find out! When cleaning your carpet yourself, you have two choices: you can rent a machine or purchase your own. Cost effectiveness is the main benefit of purchasing your own carpet cleaning system. Simply make a one-time investment, and you have quality carpet cleaning, potentially for years in the future. The main disadvantage of buying a carpet cleaning system is that these machines are usually not as powerful as those owned by professionals. However, you may not need a commercial-grade carpet cleaner. And if you do, it can be remedied by cleaning more regularly than you might otherwise. Some users who have pets or light-colored carpets might benefit most from purchasing a carpet cleaning system because the system is always available to clean as needed, even on short notice. Another option is to rent a carpet cleaning machine. While not quite as cost effective, renting a machine often means that it is professional grade (check with the rental company to be sure). You may therefore be able to clean less often than with a purchased machine because it can clean more effectively. This method is what people usually mean when they refer to carpet cleaning. It is the method traditionally favored by professional carpet cleaning companies. Hot water extraction involves soaking the carpet with hot detergent, then vacuuming it out. It’s an extremely effective method, with only one potential disadvantage: using too much water for the cleaning process can cause mildew, mold, and other water damage. This method of cleaning eliminates the risk of water damage to your carpet. The dry cleaning method uses a powdered detergent to which soil particles cling. The resulting compound is vacuumed up, leaving your carpet clean and fragrant. Other methods include the foam cleaning method and the “bonnet” method. The bonnet or “buffer” method uses spray chemicals and a specialized buffing machine. The bonnet method utilizes a special cleaning agent, and the potential for carpet damage means that this method should only be used by properly trained professionals. Before doing any cleaning, you will need to ensure that your carpet’s color will not fade or be otherwise damaged when cleaning. Test an inconspicuous portion of the carpet, such as within a closet, before beginning cleaning. 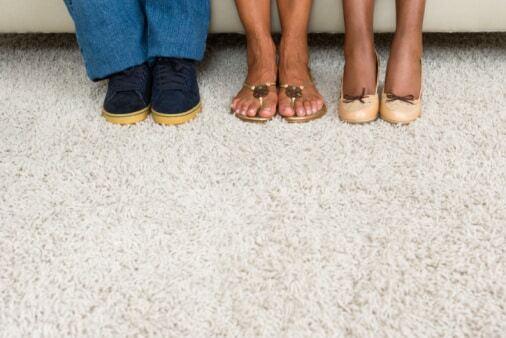 Once your carpet has passed the “colorfast test,” it’s time to protect your furniture. Remove whatever furniture you can from the space, including clutter, chairs, and small tables. Cover items that are too large to move, such as sofas, beds, and desks, with plastic tarps. Don’t forget to cover the legs of tables and chairs so as not to damage them. Before going over your entire carpet, clean the affected areas. Use a spot cleaner such as this one to remove any stains or spots with undesirable odors. 4. Give extra attention to areas that receive a lot of traffic. Certain areas, such as hallways, receive more use than others. Use a spot cleaner such as Worldwide Janitor’s Carpet Spotter to pre-treat them. 5. Take your time cleaning the carpet. Closely follow the directions on your cleaning product and machine for the optimal carpet clean. If using the hot water extraction method, be careful not to use too much water. If using the dry carpet cleaning method, use the proper amount of detergent for your carpet type and space. During this step, take your time. It’s best to make sure you cover the entire surface. Watch for easy-to-miss areas such as closets, corners, and beneath desks and furniture. 6. Follow your cleaning system’s after-use instructions. Even the most perfect carpet cleaning session can be ruined by not following the instructions on your product after cleaning. This may involve planning ahead so as not to tread on the carpet for a designated period of time after washing. Your carpet is a reflection of your business or organization. Make sure that you have a system in place to ensure that it reflects professionalism and cleanliness. With Worldwide Janitor, find a system that also saves you money. This entry was posted in Carpet, Furniture, General Cleaning and tagged bonnet care, Carpet Spot & Stain Remover, carpet spotter, Low-Foam Carpet Detergent. Bookmark the permalink.